Electronic Ceramics Market Size will surpass USD 15 billion by 2025; according to a new research report by Global Market Insights, Inc. Dynamic growth in European healthcare sector due to increasing number of aging population and advent of chronic diseases is one of the crucial factors constituting to the regional electronic ceramics market growth. Electronic ceramics, also called electroceramics, are used in various laboratory analytical apparatus, x-ray equipment and also employed in photomultipliers of various medical imaging systems to create 3D images. This in turn will help surgeons to perform various complex medical procedures with better accuracy. Globally, expenditure in the healthcare sector is going to rise by 50% reaching over USD 8.5 trillion by 2020. European healthcare expenditure is high as compared to other regions, with the German healthcare expenditure reaching the highest in the region at close to USD 385 billion in 2015. This was more than a tenth of the country’s GDP. The above-mentioned trends are projected to continue and will bolster the electronic ceramics market growth by 2025. Surge in telecommunication sector will be another key causative factor for the electronic ceramics market growth. Electroceramics are easily laser trimmed to be used in antenna chips of mobile phones, automobiles, and various other industrial and consumer electronic products. Large cellular phone consumer base in Asia Pacific has resulted in huge investments done by leading players in the telecommunication sector. By the end of 2016, about 2.5 billion of unique subscribers were present in the region which is around two third of the regional population. Mobile broadband connections are also expected to reach from 50% in 2016 to 72% by 2020. The technological advancement coupled with increasing disposable income is expected to boost the subscriber penetration in future. Government of emerging economies are also taking steps to bolster sector by promoting domestic manufacturing through easing of rules and regulations. This will give an up thrust to the electronic ceramics demand in market over the forecast timespan. Based on revenue, piezoelectric ceramics will witness a growth rate of about 5% over the forecast time period. The product shows piezoelectric effect which means on the application of mechanical stress it produces electric signals. Various devices such as power transformers, sensors, ultrasound imaging, actuators are made using this effect either directly or conversely. 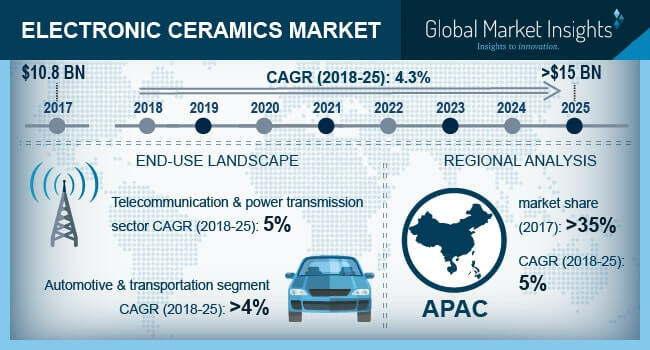 Based on revenue, automotive and transportation sector shows a considerable growth in the end-user segment of electronic ceramics market with a CAGR of more than 4% from 2018 to 2025.The product is used in parking sensors, airbag sensors, actuators and in the fuel injectors of the diesel engines as replacement of conventionally used solenoid valve devices. Growing population along with improving standard of living will result in the growth of the automobile sector, thus driving product demand in coming years. On the basis of region, Asia Pacific electronic ceramics market will witness a growth rate of about 5% with revenue reaching beyond USD 6 billion by 2025. Significant increase in the purchasing capacity of the regional population will spur the demand for consumer electronics and home appliances, thus catapulting the product demand in the region. Some of the key players of electronic ceramics market are APC International Ltd., Morgan Advanced Materials, Kyocera Corporation, CeramTech Holdings Gmbh, Central Electronics Limited, Maruwa Co.Ltd., Sensor Technology Ltd., PI Ceramics, Murata Manufacturing Co.Ltd., Sparkler Ceramics Pvt. Ltd, and Vinayak Techno Ceramics.